Does it seem like we’re in a kindness crisis these days? According to a poll by Kindness USA, only 25 percent of Americans believe we’re living in a kind society. More than half said kindness has deteriorated in the past ten years. The good news is that kindness and opportunities to be kind are definitely out there and you can model them for your grandchildren. In fact, doing simple kind acts can have a huge impact on your life. 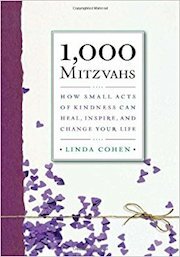 Just ask Linda Cohen, author of 1,000 Mitzvahs: How Small Acts of Kindness Can Heal, Inspire, and Change Your Life. Cohen wrote the book to honor her father who passed away from lung cancer in 2006. Prior to his death, she and her father discussed the idea of doing mitzvahs (good deeds) in his memory. Touched by the donations her friends made in memory of her father, she was inspired to begin a mitzvah project of her own. She set a goal to perform 1,000 mitzvahs — to help others in small ways and create good feelings to compensate for the pangs of grief and sadness she felt after losing her father. When she began her project in early 2007, her son was in kindergarten and her daughter was in third grade. She included them in the project by sharing her daily examples and encouraging them to find their own ways to do good deeds. By the time she’d been doing mitzvahs for a year, there was no denying that what had started out as a small idea had become something incredibly important in her day-to-day life. After the first year, she had no intention of stopping and was more committed than ever to reach her goal of 1,000 mitzvahs. In May 2009, nearly two and a half years after she began, she organized a final 1000th mitzvah celebration at a food bank and asked others to help her collect one thousand bags of food. The celebration brought in more than two thousand pounds of food for the food bank. During her project, she discovered that, aside from the moral virtue of doing kind acts, being kind is good for your health and happiness. The giver of kindness receives as much benefit or more than the recipient. Her biggest lesson was learning that the key to living well is to be in service and give of yourself. We are presented with the opportunity to help someone every single day. Whether or not we act on those opportunities is completely up to us. Cohen didn’t set out to save the world. She didn’t even profess that any of her 1,000 small actions would stand out as particularly important or life-changing. But what she learned is that each of them made a small impact and that cumulatively they have changed her life. Carry small bags of non-perishable food in your car and give one to a homeless person you see on the street. Let a fellow shopper go ahead of you in the checkout line at the grocery store. Compliment someone for their outstanding service and let them know they’re appreciated. Pick up litter on the sidewalk, in your neighborhood, at the park, at a school, or wherever you see it. Take your compact reusable bags on vacation. Clean up after your pet, even if it means returning to the location to do so. Find a local retirement community, hospital, or special education school that will let you bring in your well-behaved dog. Call or visit an elderly or homebound neighbor to see how they’re doing. Send a note to an old teacher, friend, mentor, or colleague, and let them know the positive impact they had on your life. Ask that others honor your birthday with acts of kindness instead of gifts. Sometimes you give and sometimes you receive. Being consciously aware that each and every day presents you with an opportunity to engage in positive ways with others only requires a subtle shift in perception. And acting on these small moments can and will affect your karma and the karma of the world at large. Every time I go out on errands…usually with at least one grand child in tow, I make a practice of ” connecting ” to the clerk, bank teller, or any person working where I shop. If I am standing in line, I hope to chat in a friendly way with someone else in line. I look to compliment them, make a small joke, and always serve it with a big smile. If it looks as if they are harried, I show compassion. While I donate to charities, I believe these small gestures on a daily basis make an impact on our lives. I love how these people react to my small gestures. They ” soften “, smile back and we both leave with a better attitude .